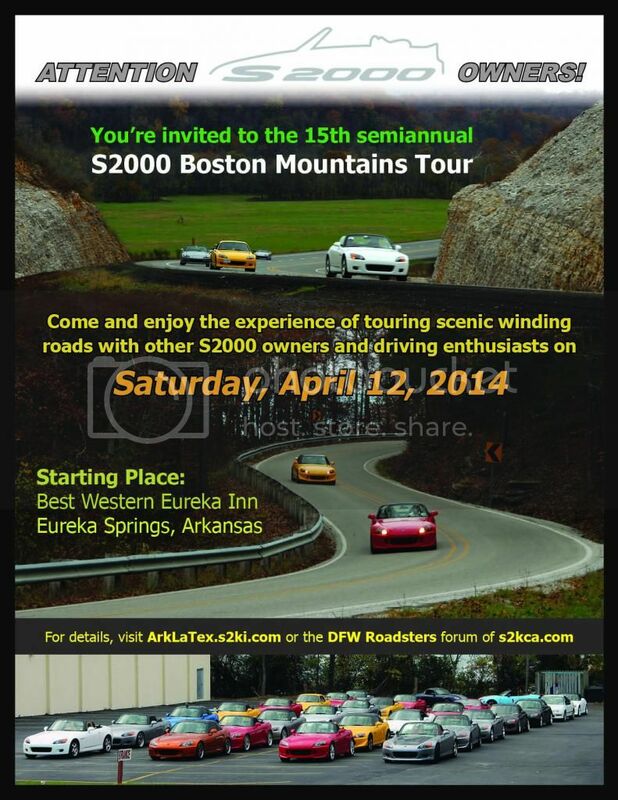 Dear Friends You are invited to attend the 15th Semi-annual S2000 Arkansas Boston Mountains Spring Tour 2014. The Spring 2014 Tour will cover some of the best winding and scenic roads that the Arkansas Boston Mountains range have to offer. These roads can offer something challenging to even the most experienced drivers. All drivers are given a tour packet, that will have your group number, route turn-by-turn directions, lunch and dinner maps (if applicable). The Arkansas Boston Mountains Tour is one of the best environments for you to fully enjoy what your sports car was made to do, TURN! The BMT is a great social event as well, you have the opportunity to meet great people from across 6 different states. We look forward to seeing you there! DaddyZ (Bobby Jay) Welcome Back! JimmiJ +1 (Jim & Connie)Last BMT We'll miss you guys! If there is a vote for starting location: Eureka Springs. Count me in, Tim (possible +1, will confirm that later), Missouri, and I for sure will be there!!! I'm in! 1 passenger! Tuttle Oklahoma! Confirmed! I'm in, I will schedule some vacation. Tulsa group, I may want to join in if your do a group drive from Tulsa to Arkansas the day before this BMT. Oklahoma Convoy thread is up for folks coming from or going through Oklahoma.